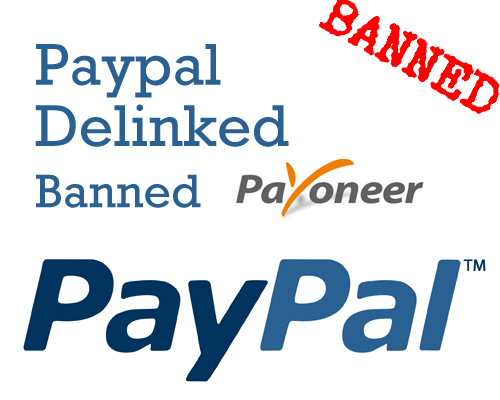 A bad news spread all around the Internet community when tons of PayPal accounts were de-linked with their US Payments Service (Payoneer Service). PayPal apparently took this step to curb the un authorized Paypal accounts that were being run in Unsupported Countries. Even though I previously posted a detailed post on verifying PayPal accounts using Payoneer in unsupported countries, though I'm afraid that doesn't work any more, atleast for sometime untill Paypal might decide to revert it's decision of dropping down Payoneer. For me, my Payoneer was delinked with Paypal about a week or two back, and after that, PayPal doesn't seem to accept Payoneer card / US Payment Service. This means that a lot of people won't be able to withdraw their Paypal payments via Payoneer anymore. Why Would PayPal Do That? Thank you for contacting PayPal. This is XXXXXX, your Account Specialist for today. I hope you are doing well. Mr. XXXXXX, I can see that your bank account was processed through Payoneer. Please be advised that we just had an update that effective immediately, as a security measure, we will no longer process transactions to bank accounts from Payoneer regardless of the country the customer resides in. This must be the reason that you were getting an error message when in you tried to withdraw funds. For security reasons, we cannot disclose as to why we can no longer transact with Payoneer. Please try to add a different US bank account. This clearly shows a next step from Paypal to curb down the use of their service in UnSupported Countries. So now, even if you'd try to link your Payoneer card or US Payment Service virtual bank account in PayPal, you'd be asked to confirm your identity via a valid phone number in the country that is mentioned in your profile. That means, Paypal would ask you to confirm your cell number via text message with the code they'll send. Even if someone uses a service online (tons of services out there) to route US phone number to local numbers to recieve the phone call, PayPal also checks for the identity of the phone number it's self. So if the number is not on your orignal name (The name of the Paypal account), you won't be allowed to enter that phone number in the first place. There is nothing much one can do. Just make sure that you cashout your Paypal cash as soon as possible if you're using in Un-Supported country before your account is taken down too if it's not done yet. We'll keep looking for a way out and a possible solution and will keep you fellows posted. Do share your views and experience on this latest pin down from Paypal.